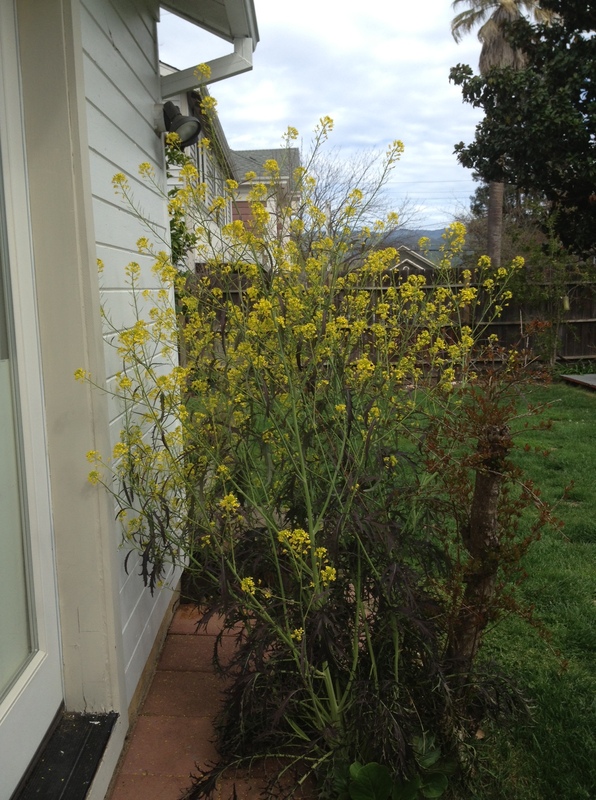 Remember this mustard green plant that I was letting bloom? Well, it had become one of my favorite parts of the garden. There it was, right outside my kitchen window, wild and beautiful. I was still harvesting from it, and the eight-foot tall blooms were attracting the most interesting pollinators. I would sit with a cup of tea and watch them work. Then there was the matter of the volume of seed pods it was producing. I couldn’t wait to harvest them and do something fun, like make my own mustard. And then, yesterday afternoon while I was on a hike, the gardener decided to rip my gorgeous plant out of the ground. The owners of the house want to ensure their yard stays nice, so the gardener is included in the price of our rent. Is it great to have someone mow the lawn and weed? Absolutely. Plus, he’s a nice man who brings his family with him, and it’s cute to watch his oldest son swell with importance when his dad asks him to mow, and his younger kids stomp around the yard with the watering can. But not getting to make decisions about what happens in my own backyard is incredibly invasive and just plain yucky feeling. I’ve been avoiding looking out my kitchen window all morning. I have a call in to ask that he please not remove any plants without asking, and I’m sure he will be mortified and apologetic and accommodating in the future. But I had to write this down to get it off my chest and move on with my day. I realize that “my gardener made a mistake” is a total first-world problem, but I’m still upset about it.